I love the ethereal blouse and raglan top! Everything is stunning. I really like Caila Mades summer skirt! I love the shirt Sewbon made! The ethereal dress is so pretty! Great giveaway, thank you. I love them all. So many variations. So great. The raglan tee, as it is a pattern I could use for myself :-). Thanks for trying out adult patterns, yay! The ethereal dress is my favorite. Gorgeous! I love the ethereal dress! My favorite was Welcome to the Mouse House’s ethereal dress. The Celestial Pullover. Thanks for the chance to win! ADORE the ethereal dress. Wonder if I could make it in a knit. I love sewmuchado’s raglan tee. Such a little cutie in the pink tee and leggings. I love the celestial pull-over, and I love the fact y’all are from LO more! Go Oregon! I like SewChibi’s Etheral Dress and a Seraphic Raglan mashup for Azriella. 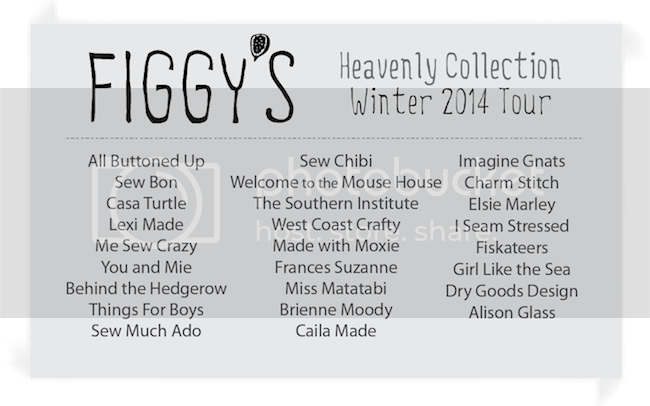 I am a big fan of Figgy’s. I think seing all those interpretations of the various patterns is so inspiring. The must: the patterns for boys, modern, cool and practical!!! I liked the inventiveness of the “slashed” boys’ raglan T by Sewing Mama Raeanna! I love the ethereal dress!! My favorite so far has even the cute little tops from Leximade. They are exactly the style I would have made! The stellar dress and tunic are very cute, especially because I think with the right fabrics, the tunic could be adapted for a boy! The Ethereal dress & blouse is my favourite and I’ve seen so many cute versions. Especially the one at www.welcometothemousehouse.com/! I want to make the seraphic raglan. It looks great in all the sizes and I have three to sew for. I love the Ethereal Dress pattern! The celestial tee is so great! What an awesome giveaway! I love it! I adore the Ethereal Dress! It’s gorgeous. Behind the Hedgerow’s dress was so cute! I love the ethereal dress you made out of the new Michael Miller Glitz!!!! Soon excited for this collection!! It is a very cool collection. I have Heavenly Pattern bundle and have been wanted to make some of the patterns in it… but maybe Nituna jacket first. I already cut the fabric! love the ethereal tunic beautiful! I love the etheral dress! I like the Figgy’s Ethereal Dress by You & Mie, the material for the frill is gorgeous. I love the raglan shirt, and the post on All Buttoned Up made me feel I might actually have time to make it. I like this pattern because I can see making it so many times. Incredible collection!!! Difficult to choose just a fav one!! I am loving your Ethereal tunic! I bought the pattern now to make it! What a great line up for the tour! I love the Ethereal dress/tunic a lot. I think this could be a lovely, unique, comfortable staple for my daughter. So many to choose from. What caught my eye most was the Ethereal tunic. Thanks for making such unique childrens clothes patterns. If I had enough time & fabric, I would love to make every one of your patterns. My first port of call would be your Stellar tunic pattern though. I am loving the two Seraphic Raglans i’ve seen so far! Definitely on my to-make list!! A favorite is definitely the Ethereal dress/tunic. I’m loving the Celestial tee! The maxi skirt is adorable, but the whole collection is AMAZING! Thanks for the chance to win such a fabulous prize package!! I was brought here today by the Seraphic Raglan Tee dress made by I Seam Stressed! I like all your patterns though of course. Love the new collection! I adore the Seraphic Raglan by I Seam Stressed…. I love Kataryna’s Seraphic Raglan with the gold trim. Just adorable! I love the maxi skirt that Rachael from imagine gnats made. My sister would love it! The tour just started, but I just love the Ethereal dress pattern! I love the tunics from Imagine Gnats so far, but I can see a lot more favourites coming up!!! my favorite are the leggings!!!! My favorite is the ethereal dress/tunic pattern. So pretty. I love the ethereal dress for my grandaughter. There are so many. Swing coat. Right now. I love the ethereal dress and blouse! I like the ethereal dress pattern. Hoping to see some celestial tees! Just found this website and would love to win! I love to sew and quilt! Really like the ruffles in the skirt of the Scirocco pattern. So girly and cute! Thank you. The celestial tee and raglan top are cute…I like them all!!!!! I love the leggings…so easy and quick! I like the leggings. So easy and quick. I love the tunic and I know my daughter would love it as well. I love the Seraphic pants – and made them for Stylo Mag :-). My favourite is de the heavenly dress. It’s very hard to pick a favorite from all these, but I love love LOVE the Ethereal dress/tunic. I love the Ethereal dress and blouse and think my two girls would too! Thanks for the giveaway and I’ll be watching/following the tour. I love the ethereal dress & blouse – any chance your patterns will expand to a bit larger sizes – like up to size 12 – I definitely think they would be popular as patterns for that pre- teen group are no very prevalent! The blanket stitch on the tunic is so charming!